The presence of Emerging Organic Contaminants (EOCs) within the environment has drawn a lot of attention in recent years due to their unknown long-term effects on aquatic life and human health. EOCs include pharmaceutical and personal care products and illicit drugs, and their concentrations in UK surface waters have been reported in the range of ngL-1 to µgL-1. There are numerous sources of EOCs including agricultural run-off, hospital effluent, septic tanks and pharmaceutical industrial plants. However, their main entry route into the environment is from the discharge of effluent from waste water treatment plants (WWTPs). EOCs are polar by nature and have varying physicochemical properties (log Kow, water solubility, acid dissociation constant and vapour pressure). 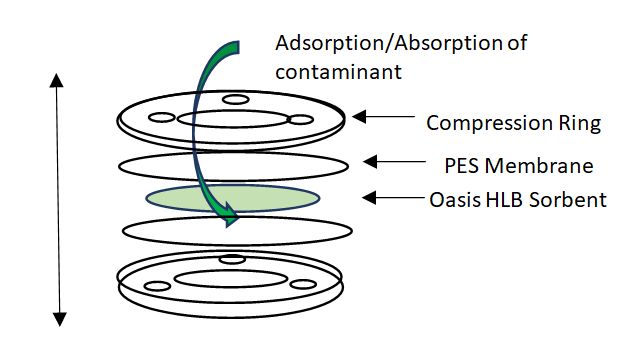 Once discharged into the environment, EOCs can degrade into the corresponding metabolites and therefore partition into a variety of environmental compartments. Robust and widespread monitoring programmes are therefore essential. Traditionally the most commonly used sampling technique for river water has been spot sampling as well as 24-hour composite sampling (time, volume or flow proportional). However, spot sampling only provides a snapshot of the concentration of contaminants within the environment and is unable to capture spatial and temporal variations . Passive sampling devices (PSDs) are proposed as a low-cost and easy-to-use alternative, as they can be deployed in large numbers for much longer periods of time (up to several months). Passive sampling relies on the transport by absorption or adsorption of micropollutants from the sample matrix (i.e., the surrounding water) to the receiving phase (the sorbent) driven by the difference in chemical potential between the two types of media . PSDs can be used to measure time-weighted average (TWA) concentrations for comparatively long time periods (≥ 7 days). There are many advantages of PSDs over traditional methods. PSDs provide TWA concentrations, are non-mechanical, easy to use and require no maintenance, can be deployed in a range of different environments, particularly sampling sites which have limited access. As passive samplers concentrate the analytes on the sorbent material, their detection limits tend to be much lower than those in spot sampling. There are generally two types of passive sampling devices used to measure concentrations of polar organic contaminants: Polar Organic Chemical Integrative Samplers (POCIS) and the Chemcatchers . The diagram in Figure 1 illustrates the assembly of a POCIS device. Its main components include a compression ring, a polyethersulfone (PES) membrane and the Oasis Hydrophilic Lipophilic Balance (HLB) sorbent, which has the ability to extract a broad range of polar organic compounds . The Chemcatcher sampler typically contains a styrenedivinylbenzene adsorbent bound in a PFFE disk . The membrane material used in PSBs is very important as it acts as a semi permeable barrier between the sorbent and surrounding aquatic environment [4, 5]. As such, it allows polar molecules to pass through to the sorbent, while filtering out particulate of diameters greater than the pore size. If the membrane is damaged or compromised, site-specific biases can be introduced in the measurement, leading to reduced uptake of the target compounds as a result of biofouling. To quantify TWA concentrations of organic pollutants, PSDs must be calibrated. This involves measuring the sampling rate (RS) of the device, which can be achieved either using a flow-through exposure tank in the laboratory, or by in situ calibration . The latter method is highly recommended for determining an RS value representative of the exact location where future measurements will be made. In comparison to laboratory calibrations, there have been very few in situ calibrations performed for organic contaminants, mainly due to the considerable effort they require . However, it is considered essential for quantitative purposes because it accounts for site-specific factors, such as matrix composition and hydrological conditions, which otherwise could not be replicated under laboratory conditions. Zhang et al. (2008) have shown that RS values for a selected group of endocrine disrupting compounds (EDC) differ between in situ and laboratory calibrations. In situ calibrations require an extensive equipment set-up, which would need to be maintained. Calibration procedures are also very labour intensive and involve collecting and processing large amounts of both spot samples and passive sampling devices to calculate an average sampling rate (RS) . Calibrations are usually conducted over a period of 1-2 weeks; once validated, the calibrated RS values can be deployed for field measurements for longer periods. where Cs(t) is the concentration of the analyte in the sampler at exposure time t, Cw is the analyte concentration in the aquatic environment, and k1 and k2 are the uptake and offload rate constants respectively [2, 6]. where MS(t) is the mass of analyte accumulating on the receiving phase at time t, and RS is the sampling rate (typically given in units of L d−1), which can also be interpreted as the volume of water cleared of analyte by the device per unit of exposure time. When RS is known, CW (i.e., the TWA concentration of the pollutant in the water) can be calculated from the sampling rate (RS), exposure time (t) and the amount of analyte MS(t) trapped by the receiving phase . Water flow rates, water temperature, biofouling, salinity and pH all affect the uptake of organic compounds in passive samplers . The majority of pharmaceuticals entering the environment have acidic hydrogens that can dissociate, forming anion/cation structures. This process is pH dependent, and 50% of the species will be dissociated when pH = pKa. This implies that pH can affect the sampling rates of contaminants. Li et al. showed a threefold increase for basic compounds under increasing alkaline conditions in POCIS devices, and a similar decrease for acidic compounds. The type of membrane used in POCIS devices has also been shown to affect Rs values. Zhang et al. observed that polyethersulfone membranes returned higher Rs values for EDCs than polysulfone ones . The surface area of the membrane in a passive sampler has also been shown to affect Rs. There has been debate about whether Rs values can be predicted using the physicochemical values of individual polar organic contaminants. To avoid long calibration periods, ideally Rs could be determined using values such as log Kow and log Dow . However, this has not been possible due to the limited amount of field data available on Rs . The diverse functional groups which are present in polar compounds and the associated complex interactions that are possible also make modelling the uptake rate very challenging . Several studies have investigated trends in Rs for different alkylated phenols, pesticides and EDCs, but found no significant correlation between molecular structure and Rs . Another area of research which has drawn particular interest is compound chirality, as approximately half of all drugs available are chiral and exist as enantiomers . Many stereoselective processes in human metabolism and in waste water treatment plants lead to enrichment of one of the enantiomers in waste water effluent and, consequently, in the environment. In some instances, it has been observed that chiral micropollutants display enantiospecific toxicity . Future studies should aim towards reporting pollutants with chiral centres at enantiospecific levels to improve monitoring and risk assessments. Presently, passive samplers have not been assessed for determining the enantiomeric distribution of chiral compounds in the environment. The traditional method used to measure organic pollutants in river water has been filtration, followed by solid phase extraction (SPE), and then analysis by gas or liquid chromatography coupled with mass spectrometry. In the case of using gas chromatography, a derivatisation step is required. However, analysing the sorbent material of the passive sampler after a deployment period in the environment is slightly different, as there is no requirement of SPE. The sorbent material is removed and extracted using a polar solvent such as methanol, dried down and reconstituted in a suitable solvent and transferred to vials for analysis. Petrie, B. et al., (2015) A review on emerging contaminants in wastewaters and the environment: current knowledge, understudied areas and recommendations for future monitoring. Water research, 72, 3-27. Vrana, B. et al., (2005) Passive sampling techniques for monitoring pollutants in water Trends in Analytical Chemistry, 24, 845-868. Zhang, Z. et al., (2008) Analysis of emerging contaminants in sewage effluent and river water: Comparison between spot and passive sampling, Analytica Chimica Acta, 607, 37-44. Harman, C. et al., (2011) In situ calibration of a passive sampling device for selected illicit drugs and their metabolites in wastewater, and subsequent year-long assessment of community drug usage Environmental Science & Technology, 45, 5676-5682. Kresinova, Z. et al., (2016) Passive sampling of pharmaceuticals and personal care products in aquatic environments European Journal of Environmental Sciences, 6, 43-56. Harman, C. et al., (2012) Calibration and use of the polar organic chemical integrative sampler—a critical review Environmental Toxicology and Chemistry, 31, 2724-2738. Li, H. et al., The effects of dissolved organic matter and pH on sampling rates for polar organic chemical integrative samplers (POCIS). Chemosphere, 83, 280-371 (2011). Moschet, C. et al., (2015) Assessment of soil multi-functionality to support the sustainable use of soil resources on the Swiss PlateauWater Research, 71, 306-315. Bauerlein, PS. et al., (2012) Sorption behavior of charged and neutral polar organic compounds on solid phase extraction materials: which functional group governs sorption? Environmental Science and Technology, 46, 954-961. Kasprzyk-Horden, B. (2010) Pharmacologically active compounds in the environment and their chirality Chem. Soc. Rev, 39, 4466-4503. Stanley, JK. et al., (2006) Enantiospecific toxicity of the β‐blocker propranolol to Daphnia magna and Pimephales promelas Environmental Toxicology Chem, 25, 1780-1786.